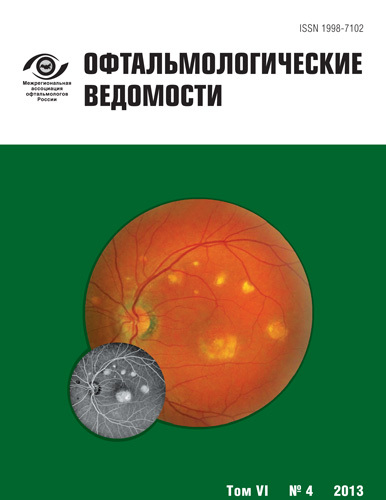 Authors: Astakhov Y.S., Belekhova S.G.
66 healthy people (124 eyes) with different degrees of myopia and emmetropia were examined using enhanced depth imaging optical coherence tomography (EDI-OCT) using the “Spectralis OCT”. It was found that the choroid in subjects with medium and high degrees of myopia was significantly thinner than that in the control group. In the study, a negative correlation was found between the subfoveal choroidal thickness and the degree of myopia (r = -0.75, p < 0.0001). It was also found that the subfoveal choroidal thickness decreased for each diopter of myopia by approximately 18.03 μm. EDI-OCT, myopia, choroid, optical coherence tomography, EDI-OCT, choroidal thickness, uvea. Curtin B. J., Karlin D. B. Axial length measurements and fundus changes of the myopic eye // Am. J. Ophthalmol. - 1971. - Vol. 1. - P. 42-53. Fujiwara T., Imamura Y., Margolis R., Slakter J. S. et al. Enhanced depth imaging optical coherence tomography of the choroid in highly myopic eyes // Am. J. Ophthalmol. - 2009. - Vol. 148, N 3. - P. 445-450. Geitzenauer W., Hitzenberger C. K., Schmidt-Erfurth U. M. Retinal optical coherence tomography: past, present and future perspectives // Br. J. Ophthalmol. - 2011. - Vol. 95, N 2. - P. 171-177. Guyer D. R., Schachat A. P., Green W. R. The choroid: structural considerations In: Ryan S. J., ed.-in-chief // Retina. Philadelphia: Elsevier Mosby. - Vol. 1. N 4. - 2006. - P. 33-34. Hee M. R., Izatt J. A., Swanson E. A., Huang D., Schuman J. S., Lin C. P., Puliafito C. A., Fujimoto J. G. Optical coherence tomography of the human retina // Arch. Ophthalmol. - 1995. - Vol.113, N 3. - P. 325-332. Imamura Y., Fujiwara T., Margolis R., Spaide R. F. Enhanced depth imaging optical coherence tomography of the choroid in central serous chorioretinopathy // Retina. - 2009. - Vol. 28. - P. 1469-1473. Margolis R., Spaide R. F. A pilot study of enhanced depth imaging optical coherence tomography of the choroid in normal eyes // Am. J. Ophthalmol. - 2009. - Vol.147, N 5. - P. 811-815. Metelitsina T. I., Grunwald J. E., DuPont J. C., Ying G. S., Brucker A. J., Dunaief J. L. Foveolar choroidal circulation and choroidal neovascularization in age-related macular degeneration // Invest. Ophthalmol. Vis Sci. - 2008. - Vol. 49. - P. 358-363. Povazay B., Hermann B., Unterhuber A. et al. Three-dimensional optical coherence tomography at 1050 nm versus 800 nm in retinal pathologies: enhanced performance and choroidal penetration in cataract patients // J. Biomed. Opt. - 2007. - Vol. 12, N 4. - 041211. Saw S. M., Gazzard G., Shin-Yen E. C., Chua W. H. Myopia and associated pathological complications // Ophthalmic. Physiol. Opt. - 2005. - Vol. 25. - P. 381-91. Spaide R. F., Koizumi H., Pozonni M. C. Enhaced depth imaging spectral-domain optical coherence tomography // Am. J. Ophthalmol. - 2008. - Vol. 146. - P. 496-500. Copyright (c) 2013 Astakhov Y.S., Belekhova S.G.